Trondheim is a city and municipality in Sør-Trøndelag county, Norway. 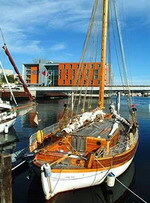 The city of Trondheim was established as a municipality on 1 January 1838. The rural municipalities of Byneset, Leinstrand, Strinda, and Tiller were merged with Trondheim on 1 January 1964. The Best Western Chesterfield is a modern hotel, decorated in a traditional English style, situated 200 metres from the central bus and train stations and the concert hall. The 43 guestrooms are decorated in rich creams, reds and greens, and all have complimentary wireless Internet access, satellite television, hair dryers, and telephones. Guests can work up a sweat in the sauna or relax by the open fire in the lobby bar. Complimentary wireless the Internet access is available throughout the hotel, or guests can make use of the hotel's own computer. Conference rooms cater for up to 20 delegates and offer audio-visual equipment and a variety of hospitality options. Multilingual staff at the 24-hour front desk can assist with information on local attractions and dining recommendations. The nearest golf course is eight kilometres away and there are ski slopes 10 kilometres away. 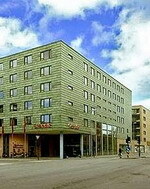 Trondheim International Airport is 30 kilometres from the hotel, a drive of around 30 minutes. The Radisson SAS Royal Garden Hotel is a contemporary riverside hotel with striking glass façade, located within 500 metres of the old town, cathedral and fish market. The hotel offers two dining options: Prins Olaf Grill serves a wide range of local and international dishes in a relaxed setting decorated with nautical memorabilia, while the informal Bakkus Matt & Vin is located in an indoor courtyard surrounded by glass and offers breakfast and light lunches. Guests can work out in the fully-equipped gymnasium, go for a refreshing dip in the swimming pool and enjoy some relaxation time in the sauna and jetted tub. The hotel has indoor gardens and glass-covered courtyards where guests can relax with a book and a drink from the Galleriet lobby bar. Nidarosdomen (the cathedral), Ravnkloa (the fish market) and Kristiansten Festning (the fortress) are all within one kilometre of the hotel. Trondheim Airport is 33 kilometres away, around 30 minutes by car. 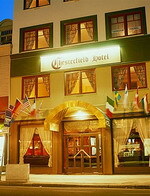 The Rica Nidelven Hotel is located in Trondheim, Norway. 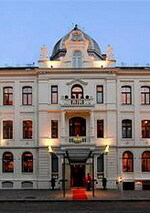 Solsiden Shopping Mall is 100 metres away, and the Archbishop's Palace and Nidaros Cathedral are both 700 metres from the hotel. The train station is situated 300 metres away. Built right into the Nidelven River, the Rica Nidelven Hotel occupies a modern Scandinavian-style property and opens to a bright, contemporary lobby area. The hotel houses a fitness room and sauna, and the onsite art gallery is open 24 hours a day. The multilingual concierge is on hand to offer sightseeing tips, and further amenities include room service and complimentary wireless Internet. The Rica Nidelven Hotel houses a colourful, modern restaurant with river views serving Mediterranean dishes. Broen Lunch and Pianobar offers light meals, snacks, and cakes. A complimentary buffet breakfast is provided. 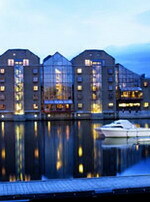 Scandic Solsiden is situated in the centre of Nedre Elvehavn, Trondheim's new business area, 500 metres from River Nidelven and the Old Town Bridge. The hotel's Lobby Bar serves drinks and light meals of international cuisine, with Internet access available, and children can enjoy the playroom which features toys and games. Guests will find a gym 500 metres from the hotel and Pirbadet, Norway's largest indoor swimming facility, is nearby with its hydro-massage pool, fitness pool, whirl pool, wave pool, children's pool, 100-metre speed slide, diving tower, sauna and solarium. Opposite the hotel is Solsiden, a shopping complex with shops, restaurant and cafes, while Trondheim Cathedral is one kilometre away. Trondheim-Vaernes Airport is 35 kilometres distance, an approximate driving time of 30 minutes.